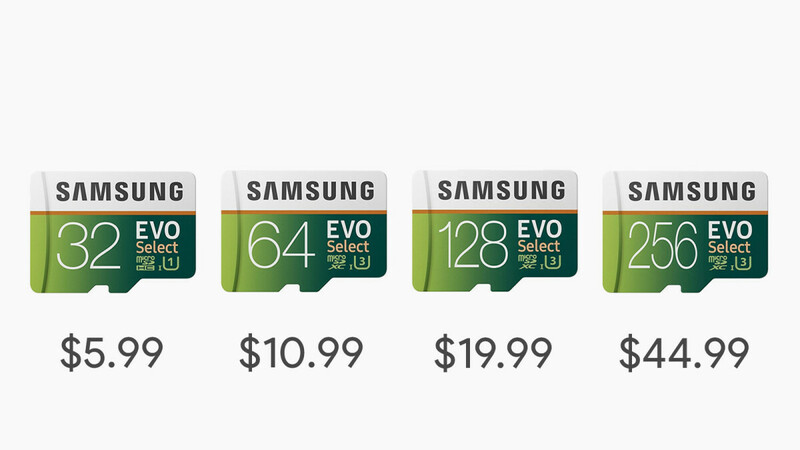 If you are looking for extra storage on the cheap — be it for your smartphone, tablet, digital camera, or whatever else — here's a deal on chosen microSD cards from Samsung's EVO series. The 128GB card, which is the best-selling Samsung EVO microSD card on Amazon, is now going for $19.99. That's $22.00 (52%) down from the original price of $41.99. However, if you're looking for a bigger card, you may want to have a look at the 256GB Samsung EVO card, which is now selling for $44.99, down from the usual $84.99. Last but not least, the 64GB card can be snatched for just $13.99. Of course, if you don't need that much storage, you can always have a look at the 64GB and 32GB EVO cards, which are now going for $12 and $5.99, respectively. Samsung's EVO-series microSD cards have Class 10 read and write speeds — up to 100MB per second and 90MB per second, respectively — which makes them suitable for 4K UHD video recording. An exception to this is the lowest storage tier, the 32GB model, which is slower, and more suited for HD video recording. However, if you care about video, all EVO cards do just fine at quickly saving high-resolution pictures.